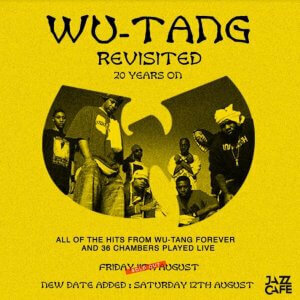 Event: Wu-Tang Revisited 20 Years On @TheJazzCafe — EXTRA DATE ADDED! The Clan’s best cuts from Wu-Tang Forever and Enter the Wu-Tang (36 Cham­bers) per­formed by the Unknown Orches­tra. It’s rare that you find one thing that all music fans agree on but here’s one; Wu-Tang Clan are undoubtedly the most import­ant, influ­en­tial and best hip-hop group of all time. Led by the dream team of RZA, GZA, ODB, Meth­od Man, Raek­won and Ghost­face Kil­lah, all of whom went on to launch suc­cess­ful solo careers in their own right, the Clan went from being under­ground cult favour­ites to bon­afide hip-hop super­stars, while nev­er los­ing sight of their upbring­ing on the streets of New York. *NB this is a trib­ute, Wu-Tang won’t be per­form­ing. Review: Dancing to Disarm! Activists come together for a night of live music, DJs and dancing.